Al Vermeil is the only strength coach to have World Championship rings from BOTH the NFL and the NBA. He is also the only strength coach who has been in the NFL, NBA and Major League Baseball. Al was honored by being one of the initial inductees to the Strength Coaches Hall of Fame in June 2003. Al is President of Vermeil Sports and Fitness, Inc. VSF specializes in athletic assessment, conditioning and training. All clients receive individualized evaluations and programs. VSF is currently training players of the World Champion Chicago Bulls, as well as select athletes. VSF's reputation for being on the cutting edge of developing athletes has lead it to become an international consulting business. His clients include Benneton Basketball of Treviso, Italy. VSF has also consulted with the, US Army Ranges Fort Benning Ga., Boston College, Mike Boyle Strength & Conditioning, San Francisco Giants, University of Alabama, University of Iowa Basketball Team, University of Miami (FL) Basketball, Stanford University Sports Medicine, Texas A & M Football Team, University of Kansas Basketball Team, University of North Carolina Basketball, Kansas State University, Los Angeles Lakers, Atlanta Falcons, Denver Broncos, Kansas City Chief, New York Giants, Philadelphia Eagles, St. Louis Rams, Chicago White Sox, The Academy of Golf at Lakeway, Nicklaus Academy of Golf, Golf Digest School, teaching golf professionals Chuck Cook, John Elliott, Mike Malaska, and Mark Woods who are all recognized in that select group of top 100 teaching pros as chosen by both Golf Digest and Golf magazine. Chucks clients have included the Mark Brooks, the late Payne Stewart, Tom Kite, and Corey Pavin. In addition to his training programs, Al has applied modern technology to the conditioning field with his development of Vermeil's Time Machine. His knowledge and implementation of new techniques and training methods have made Vermeil's programs highly visible and respected throughout the sports world. He has developed successful training programs in a wide variety of sports including football, basketball, baseball and golf. Al Vermeil was an outstanding collegiate football player at Utah State University. In l969, when college football celebrated it's first l00 years, Al was selected to Utah State's All Time Team. 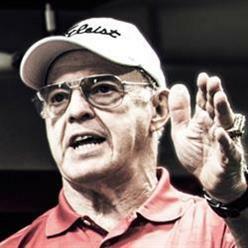 Mr. Vermeil established himself as a very successful high school football coach before joining the San Francisco 49'ers in l979 as the strength and conditioning coach. His programs made major contributions to the team's winning of the l982 Super Bowl Championship. Vermeil is often the featured speaker at many coaching clinics including the National Strength and Conditioning Association, National Athletic Trainer's Association, Italian National Basketball Clinic in Rome, Italy, Greek National Basketball Clinic in Athens, Greece and The Mayo Clinic. During his thirty-eight year career, Al has often been the subject of television, radio and newspaper interviews. He has written numerous articles for major publications including Golf Digest, The National Strength Coach Journal, Muscle and Fitness and Conditioning Association Journal, as well as several conditioning manuals. Al and his wife Diane reside in Lincolnshire, Illinois. Their daughter Elizabeth is married and working in business in Cincinnati Ohio, for Fifth Third Bank.